Daily work Log supports you to compile your daily undertakings within the routine. It’s a reminding calendar. Put in it that needs to be reminded. Every chore which you planned to perform that day can be jotted down in an organized manner. It helps you to track your activities on daily basis. You can make an alert for your pick and drop services if required that day. You can write about Payment of bills if scheduled that day. You can note down any traveling plan. Writing should be clear and easy to understand. You can hang the program anywhere in the house or clip it on the soft board in front of your home office. You can magnet in on your refrigerator. This will help other people also to have a birds-eye-view of your routine and if you miss or forget something they will make you remember. Many people find it boring to design a written structure for maintaining these daily chores, to ease the purpose various templates have been designed online which give you complete facility to note down your routine in an organized manner. The templates are available in various eye-catching designs with pre-noted dates, months and even timing. What you have to do is to write the planned task in front of the assigned time. Isn’t it helpful? 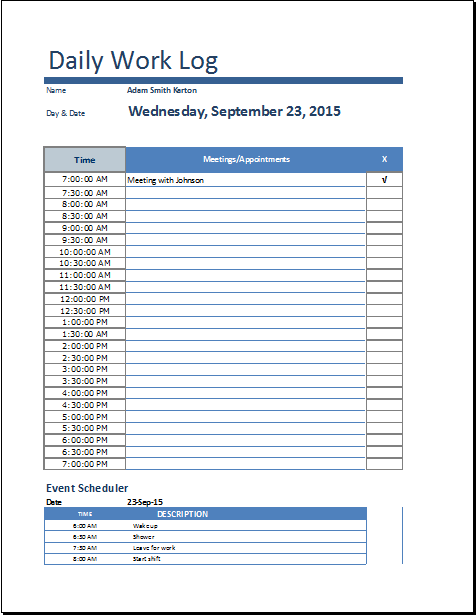 So next time you feel languid to fill a daily log just download the daily log templates and start writing.